Quest for Jackie Chan – what a day! Wow, what can I say? It was a great turn out for today’s Quest for Jackie Chan flashmob. 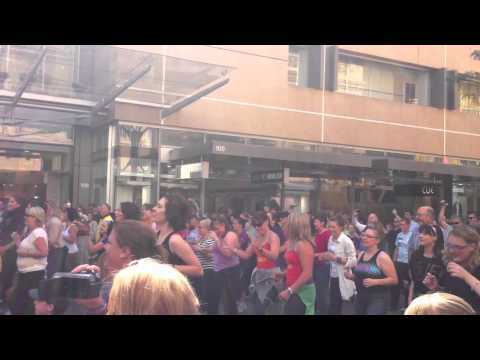 This flashmob took some of our tried and true favourites and added a Jackie Chan theme. Everyone came dressed in blue jeans and a black top to pay homage to the great Rumble in the Bronx, and the costumes were completed with our very own Jackie Chan face mask. The day went really smoothly, starting off with a great warm up session with special guest Maria Tran, who was also doing some filming for her own project that inspired today’s flashmob – Quest for Jackie Chan. In between mobs, we also made the most of every opportunity to use the mob for a bit of fun, including some spontaneous dancing with the buskers at the Malls Balls. To see what we got up to, check out the event instructions over here. It was a perfect day for flashmobbing, and we loved every minute of it. Thanks to everyone who came along and made it amazing.